In Four years of Peoples Party Government we have seen one after another Corruption Scandal of PPP Leaders. There is perhaps no ministry that is pure from Corruption. Institutions like Railway, PIA and Steel mill are near insolvency due to corruption of Government. The family of Prime Minister of Pakistan Yousaf Raza Gilani is also ahead in doing corruption. almost all family members of P.M Gilani are involved in various scandals of corruption whether his sons, daughter or wife. 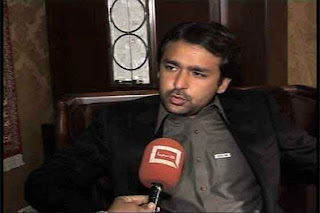 and now the latest report is that Younger son Ali Musa Gilani is also involved in Corruption and Supreme Court of Pakistan has ordered to include his name in ECL list. Name of Ali Musa is coming in chemical import case whose hearing is taking place in Supreme Court. its a big scandal of more than 7 billion rupees in which illegal sale of chemical Ephidrine was done to two companies on pressure of Ali Musa Gilani. the next hearing of the case will take place on 20th April in Supreme Court. During this time Ali Musa may try to run to a foreign country due to which SC has ordered to include his name in ECL list.